Nintendo UK has now clarified that the Yoshi Egg Game Case pre-order bonus will be available from GAME. 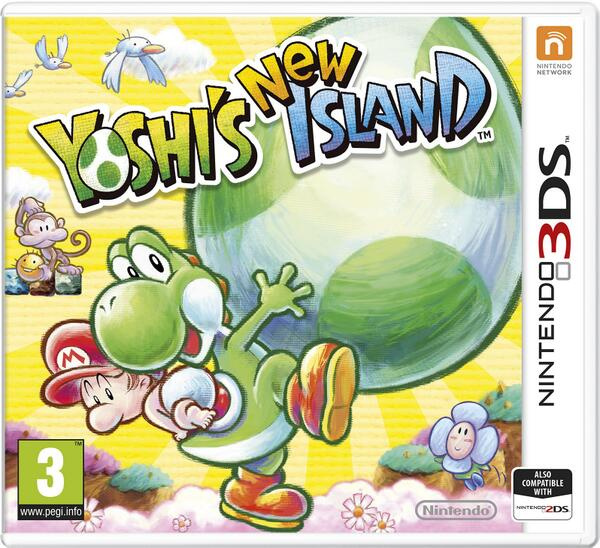 Not too long ago Nintendo of America announced, as a rather casual aside in a broader press release, that Yoshi's New Island will arrive in the region on 14th March; Nintendo of Europe has now joined in, confirming the same date for the region as well as releasing the official box art (pictured above). 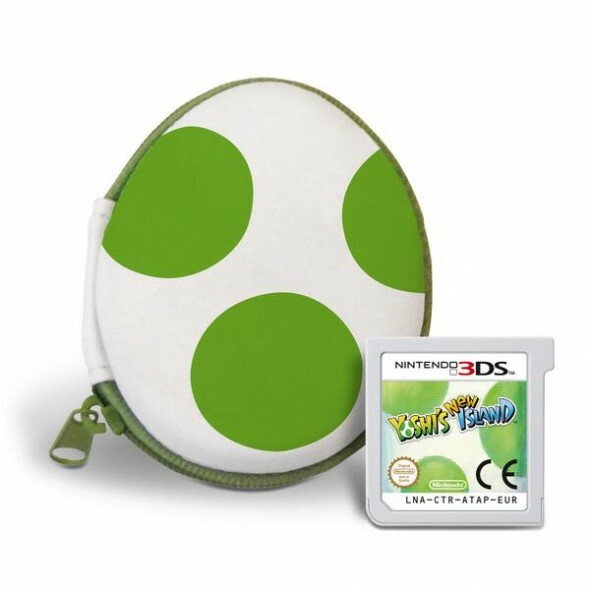 For its part Nintendo UK has also announced that pre-orders in the country can receive a Yoshi Egg Game Case, for storing games or other small things — no retailer is specified, and the linked Nintendo Store product page hasn't been updated at the time of writing. The press release for this European announcement also outlines the basic plot, confirming this as a sequel — for you Yoshi lore fans — to the excellent Super Mario World 2: Yoshi's Island on Super NES. Rendered in a variety of art styles that illustrate the fairytale charm of the Yoshi universe, Yoshi’s New Island invites you to gobble up or stomp on enemies big and small in a bid to help safely reunite Baby Mario with his brother! The tale of Yoshi’s New Island is a sequel to the Super Nintendo title Super Mario World 2: Yoshi’s Island, and is set in a new location, Egg Island. In this new chapter in the series, Baby Luigi has been whisked away once again, leaving it up to the Yoshi clan to keep Baby Mario out of harm’s way and embark on a mission of discovery. Below is the most recent trailer that was released by Nintendo. Are you interested in picking this up when it's released? I've been meaning to get back into the series this'll be a start. Hope the other babies make an appearance. I would rather see a pure Yoshi game ( Yarn?) but the island series is good. Me thinks I'm gonna pick it up. Yess So excited for this. Yoshi needs some love, people. @DarkNinja9 did you even bother to read the article? Say, the first paragraph where it mentioned NoA already announced the release date? Getting fed up with reflexive complainers who only read the title of an article. It really depends on how much new stuff is in there. The trailers don't look appealing to me, and that comes from someone who loved Island, Island DS, Touch and Go and Universal Gravitation. it is a sequel to Super Mario World 2: Yoshi`s Island! Thank you very much Nintendo. Great, this is awesome news, although it's not gonna be a day-one purchase for me. That honor goes to Super Smash Bros..
Man, Europe gets all the cool pre-order bonuses for Nintendo games. I loved the original Yoshi's Island (played it on GBA) but I really didn't like the DS one: I just felt the controls were wrong. Anyone else? @andreoni79: Yoshi's Island DS wasn't really a bad game at all. It was just hard as hell because it was designed for the veterans of the original (or the GBA version of the original, anyway). egg game case like the pokeball for X and Y? Not that interested. The Yoshi games are okay, but they've just never appealed to me as much as the mainline Mario games. I'll save my money for other games and consoles i want to buy later this year. @Katzii yup. Also, it was the first sentence... So there was no need to read the whole paragraph before jumping to a statement. If Nintendo can get to their 3DS level of output with Wii U then the console will be the only one worth having at the moment but I get the feeling their Wii U software departments are very stretched and inexperienced in making HD games.. The original had better appear on the Wii U VC soon, although there are a million other games I also want like Kemco's "Top Gear" series and Starwing. I will be getting this day one... at least so long as it's far enough apart from the release of Kirby: Triple Deluxe! but I'm very excited for both; I love Yoshi and Kirby a lot! ...also interesting that the box now has a little note in the corner about the 2DS... I wonder if that'll be on US boxes now, too? @Gioku It'll be a lot bigger on the US boxes. @ntabruzzo maybe the side of the box, instead of saying "Nintendo 3DS", will say "Nintendo 2/3DS". Day one for me as well, I just hope all my worries about this game will be gone once I actually play it, because it still seems like a pretty lackluster, tech-demo-y game as it looks now. Either way, it's a Yoshi game, so I'll buy it and keep it forever! No. I think the new art style looks horrible. The chalk/crayon art was way more vibrant than this, so I'll gladly pass up on this one. Depends entirely on the framerate for me. (If they are applying the Link Between Worlds method to this then it better be 60fps). More bothered about how it plays than how it looks. (Other than I hate Aliasing). Art style still looks worse than the SNES version, a game that came out almost 20 years ago. Quite depressing really. Nonetheless if the gameplay actually holds up (Unlike the DS game) then I might get it once I run out of things to play on the 3DS. Looks pretty good, might get it later this year! (if I haven't already spent all my cash on MK8/DKC:TF! Will get it later on though. @Katzii i think he means the game case for preorders which na will never get. @Katzii @Platypus101 Actually, I think @DarkNinja9 was referring to the game case in this instance. They weren't specific but there was no need to jump down their throat like that. Anyhoo, there's something about the Yoshi games I don't like that much. I'll wait a while before getting this one. Please be good, please be good, please be good! @Geonjaha I agree, don't get how any developer would allow a 20 year old game to look better then theirs. Why have we heard absolutely nothing about Yarn Yoshi since its announcement? What I don't like about Yoshi: After "Yoshi's Story", all Yoshi's started to sound like baby Yoshis. They even changed it in the GBA version, of Yoshi's Island, which makes me mad. If you want the only Decent version of "Yoshi's island", it's gotta be the SNES one. I'm looking forward to this game, and hopefully it won't disappoint. There's a good chance I'll get it day one, unless it has terrible reviews (averaging 5 or under). As long as the game has the same style of level design from the SNES game, im good. @Williaint I personally like Yoshi's voice. It just seems oddly fitting, for some reason. Yoshis are cute, so their voices should be too, or it would just seem out of place. 3ds games always look better on the system than screen shots. If this is anything like Yoshi's Island DS then no thanks. I did like the original on SNES, and I even played through it again on GBA to get to the GBA exclusive levels. But the DS game was just annoying. I refuse to preorder unless North America gets the bonus. I want to get excited for this, but I'm just not a fan of the art style. I play that song on my keyboard everyday. Egg-cellent, marked to calendar for potential first day perch. Damn, I have to buy this, Metal Gear Solid 5:Ground Zeroes and Ace Attorney vs Prof. Layton on March. I'm sorry if i don't understand, are you saying the island series aren't "pure" yoshi games? Keeping an eye out for reviews, this game seriously looked underwhelming and it feels like it brings nothing new to the table. This is one of those proceed with caution kinda games (for me at least). @umegames Poor wording in my comment. I was trying to imply that I would prefer to see a more yoshi-centric game. One without baby Marios and the like. Yoshi as the stand alone character if you will. I have no idea why Nintendo is not developing this themselves. Yoshi's Island DS was awful. Arzest was founded by "key members" of Artoon, so I am worried about this one (plus I'm just not a fan of the art style.) People are very correct in saying that the 1995 original looks much better visually than this does, which is sad. Nintendo doesn't let unproven developers work on their core Mario and Zelda games, so why doesn't Yoshi get the same treatment? What's With that monkey in the background of the Boxart? And why is he holding a toy sun? It's one of the enemy's from the original Yoshi's Island, I think what it's holding is more of a spiky plant enemy they used as a weapon to throw. @Diddy_kong They didn't do Mario Kart 7 themselves. Or the port of Donkey Kong Country Returns. I am not hopeful for this because I expect 30fps and not great level design. (But NIntendo's level design has not been great either in recent times for 2D games). Seeing as DKC Tropical freeze also has a identical American/European release-date, I have a good feeling that from now on Nintendo will release all their games in America and Europe on the same day! No more release-gaps!! On a side-note: I really hope this will be good (I really liked Yoshi's island DS)! But almost nothing has been revealed so far! I hope it isn't half baked! I want that case ! !